(Bloomberg) -- It’s not Black Friday -- it’s Way Day. Sales could be notably better than last year, according to Piper Jaffray analyst Peter Keith, who rates the shares overweight. That’s because this year’s Way Day is 36 hours, 12 hours longer than in 2018. Plus it’s two weeks earlier and ahead of Easter, and it’s also available in the U.K. and Germany. Sales were also more heavily advertised on TV with 900 commercial airings as of last night, versus 614 last year, according to Piper. Wayfair and Amazon.com Inc. are the two largest online home furnishing marketplaces, Keith said. In a survey conducted ahead of Way Day, Piper found that Wayfair is quickly gaining brand awareness. Of 625 respondents, 30 percent said Wayfair was their favorite brand for home furniture and decor, while Amazon was favored by 12 percent. 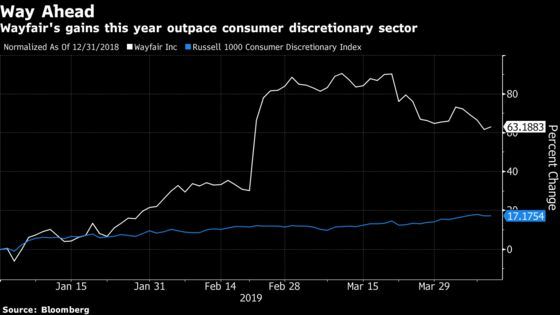 Wayfair attracts more women and upper-income shoppers than Amazon, Keith said in a note to clients Wednesday. Shares of Boston-based Wayfair rose 0.8 percent at 10:12 a.m. The stock has risen 63 percent year-to-date, far outpacing the 15 percent gain on the S&P 500 Index.